When winter cloaks the slopes of the Dolomites in its magical white garb, then it’s time to get out your skis, snowboards and other winter sports gear from the cellar and get ready for your winter holidays in the Dolomites! During the cold season the mountains of the Dolomites become a first class skiers’ paradise that leaves nothing to be desired. Young or old, beginner or seasoned professional, carver or boarder - skiing in the Dolomites, the cradle and home of skiing and winter sports in the Alps, is a special experience for everyone. Together, internationally famous ski resorts such as Cortina, Kronplatz, Alta Badia, Val Gardena and Seiser Alp form the Dolomiti Superski network, the largest ski carousel in the Alps, with a total of over 1200 km of slopes and 450 state-of-the-art lifts. Fantastic snow conditions, descents of all degrees of difficulty, plenty of sun and a picture-perfect backdrop – in King Laurin’s world, every ski resort has its own special qualities that ensure top-class ski holidays in the Dolomites. And the range of winter leisure activities goes far beyond traditional skiing: every year holidaymakers from all over the world who enjoy sports and leisure meet in the Dolomites to enjoy wonderful back-country skiing trips and winter or snowshoe hikes in the breathtakingly beautiful landscape. 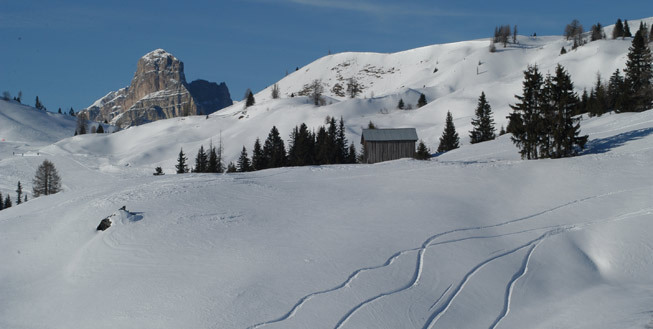 Leisurely walks through the snowy natural surroundings, relaxed cross-country skiing, fun toboggan rides and unusual activities such as ice climbing on frozen waterfalls or mountain streams round off the broad range of possibilities open to you on your winter holidays in the Dolomites. Our tip: just give it a try – your next family or ski holidays in the Dolomites are sure to be a hit!